The Division of Neonatology, part of UBMD Pediatrics and affiliated with the Jacobs School of Medicine and Biomedical Sciences at the University at Buffalo, is an academic division with a busy, thriving clinical neonatal intensive care service, active research interests, and a long-standing commitment to fellows and residents. Neonatology is a subspecialty of pediatric medicine that pertains to the care of ill or premature newborns requiring special medical care. Newborns that require neonatal care include, but are not limited to, infants born prematurely or born with low birth weight. 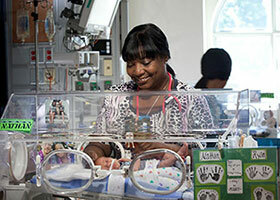 As the Regional Perinatal Center for critically ill newborns, the Neonatal division services the eight counties of Western New York and beyond. The 64-bed Level III Neonatal Intensive Care Unit (NICU) admits over 850 babies each year and has an average daily census of 50. Approximately one-third admissions are transported from an outlying hospital by the active Neonatal Transport Team, which consists of neonatal nurse practitioners and specially trained neonatal respiratory therapists, readily available to provide stabilization and transport to Oishei Children’s Hospital for any infant in the region. 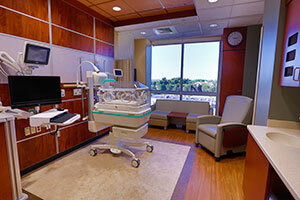 A 10-bed NICU has opened at Millard Fillmore Suburban offering parents and newborns (at least 32 weeks gestation) in the northtowns advanced neonatal care close to home. With experienced advanced care practitioners from the Regional Perinatal Center at Oishei Children’s Hospital, increased access to pediatric subspecialists, highly experienced registered nurses and a compassionate multidisciplinary care team; newborns can receive critical care and remain in the same facility as their mom.